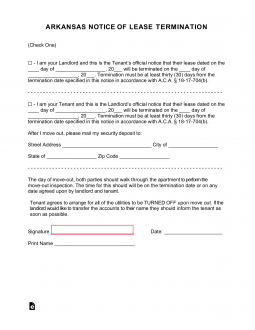 The Arkansas Termination Lease Letter is necessary when it is time to end a lease arrangement. This document should be used when one party would like to terminate a month-to-month, week-to-week, or fixed-term lease. Either party may use this form letter. That is, it is designed so that either a tenant or a landlord may utilize it to end an arrangement for either one of these types of leases. While Arkansas Landlords enjoy some of the most preferable Landlord regulations in this state, they still must abide by certain laws and regulations when terminating a lease. When a lease expires, most Tenants and Landlords will have to decide whether to renew it or not. 18-17-704 – Form must be submitted to the other party with at least thirty (30) days from the next monthly payment date. A month-to-month will automatically renew every month while a fixed term may provide the option to renew. In either case, if one party does not wish to renew when their contract terminates they should send a notice to the other party at least thirty days’ before the date of termination. There are very few circumstances in which this may be done prematurely. Only in extreme cases will an Arkansas courthouse choose to prematurely terminate a lease. While a lease is considered a contract in Arkansas, certain considerations are made since these documents deal with one’s residence or property. For instance, if either party victimizes the other in a violent crime, the victimized party may have grounds to issue this notice and move out prematurely (however be aware this may be contested). Regardless of the situation type, one must consult an attorney beforehand to verify their ability to do so. When a lease does terminate naturally, however, it can have a profound effect on the remaining party thus, even in the best of circumstances this notice must be issued as well. Step 1. Check the box that indicates your position. If you are a Landlord check the first box. Then enter the date of the lease agreement and the date the lease agreement will be terminated. If you are a Tenant, check the second box and provide the same dates in the appropriate paragraph. Below this, supply the address at which you may receive your security deposit. Step 2. Sign and print your name at the bottom of the letter.